Whether you bough, commissioned or created your own mosaic art, you need to know how to lay tile ... how to install your art work. This section is intended for your larger mosaic projects where installation of your finished art work is required and outlines the basics for this crucial and most rewarding part of the whole mosaic making process. The first step in how to lay tile is to have the right base. The base is the same as if you would install any ceramic. For floors a total of at least one inch of plywood is needed. Most floors are built using 5/8 inch plywood. To this base you will need to add an extra 3/8 or 1/2 inch plywood. It is very important to glue and screw this extra layer every 6 inches. No special precaution needs to be taken for walls. Most walls today are built according to today's building code and this is sufficient. Selecting the right adhesive is also a very important step. If you created mosaic wall art then you would use a wall adhesive, much easier to work with. But for a mosaic tile floor I do not take any chances and use an acrylic latex admixture instead of water to my dry-set mortar. This will give it extra bond strength, especially when using impervious or vitreous ceramic tiles and most difficult to bond to tiles such as glass tiles, porcelain or polished-back granite or mosaic marble tile. Grouting your mosaic is the next step. You will need to allow enough time for your mortar to dry before applying your grout. Usually 24 to 48 hours is the recommended time. During this time do not disturb or walk over the tiles. 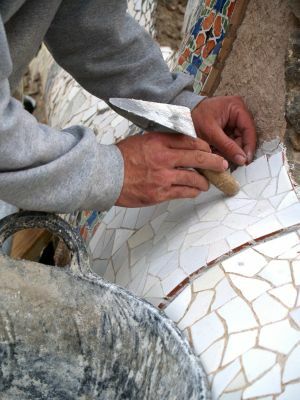 If you have mosaic pieces that came unglued do not worry, this generally happens to one or two pieces in each mosaic. You can either glue it back or leave it there and the grout will act as a second adhesive and hold the piece firmly in place. What I usually do is after 24 hrs I touch every piece in my mosaic to see if I have loose ones, then I glue them and the next day I apply the grout. The last step is sealing your tiles. Approximately seven days after applying your grout you should seal it with the appropriate grout and tile sealer. There are different types of sealers depending on the material or tesserae used in your mosaics. Your local ceramic tile store will recommend the appropriate grout sealer for your tiles. Now that you have finished your mosaic you can admire it for years to come!